This story is a mystery that includes the most famous son of the county of Warwickshire. The story was committed in print by someone who goes by the name of “A Warwickshire Man” and starts at a dinner hosted by the newly-elevated Marquess of Hertford at Ragley Hall in the autumn of 1794. During the hard drinking session the conversation at the dinner table turned to David Garrick’s notoriously farcical Shakespeare Jubilee of 1769, and then to the matter of whethe r or not the bust of Shakespeare in his funerary monument in Stratford’s Holy Trinity Church was a faithful image of the Bard. One of those present at the dinner then recalled that Horace Walpole, fourth son of the Prime Minister Sir Robert Walpole, had once offered 300 guineas to anyone who could bring him the skull of William Shakespeare. Present at the meal was Frank Chambers, an assistant doctor in Alcester who took this information entirely at face value and started dreaming up a scheme for seizing the skull and claiming the 300 guineas. In addition to the money, which would have been a fortune for a country doctor, he relished the adventure and he had also previously dealt with body snatchers, a practice common among 18th century doctors. Chambers invited three men round to his lodgings for a drink, Harry Cull, Tom Dyer and a man called Hawtin, dubious characters who dabbled in a variety of work, much of it outside the law. He told them he wanted to take a particular skull from a church at Stratford and offered three pounds each if they would help him. A few nights later, the four conspirators met outside Holy Trinity Church. They broke in then set about opening the grave. At first, they started work on the wrong one because the three were illiterate and could not read the name on the tombstone. Chambers was anxious that no-one should ever realise the grave had been tampered with so that the theft would always remain undetected and it took several hours to complete the work. Nonetheless, this was the only skull in Shakespeare’s grave and was presumably the genuine article. The men replaced the stones on the tomb and inserted old mortar, and then they smeared it with dust from the church so that it would look as if nothing had been disturbed. On the way back to Alcester, Chambers paid the men their money, bought them nine quarts of ale in the Globe pub and left them there while he took home his prize. But when he tried to sell the skull to Horace Walpole, the literary man declined to pay him for it even though Chambers reminded him of the offer he had expressed years before. Walpole agreed that he had once made such an offer, but still refused to part with any money and even sent an intermediary from London to Alcester to try and trick Chambers into parting with the skull for nothing. A fellow guest at Ragley, a Doctor Parr of Warwick, was then approached. He also refused the skull and threatened Chambers with exposure unless the skull was re-placed. So Chambers paid Dyer, one of the three men, more money to take it back to Stratford and replace it in the Bard’s grave. When Chambers visited the tomb some weeks later, he saw a new crack across the gravestone and realised that his accomplice maybe had failed in his attempt to re-open the grave. When questioned, Dyer admitted that he had been unable to lift the stone without it breaking and had hidden the skull in a church in Worcestershire. Several years later, Chambers was called out by Dyer to tend a woman who had been badly burned while helping him to melt down the lead linings of coffins to make counterfeit coinage. The church was temporarily without a priest and the gang had moved into a crypt there to carry out their illegal trade. While tending to his patient Chambers discovered that the church was where Shakespeare’s skull was hidden. The secret of the stolen skull went with the doctor to his grave, but 50 years after it had been taken, ‘A Warwickshire Man’ claimed to have discovered that secret by investigating clues left behind in Chambers’ papers. Chambers had sought assistance on his journey to the church at Gorcott Hall and it seems that the church where he retrieved the skull was St Leonard’s Church at Beoley. In addition the Chambers family occupied the Manor House in nearby Studley for many years. It is said that he returned the skull to its rightful resting place and did not reveal the story for another 35 years when everyone connected with the scandal had died. A Warwickshire Man’s story is full of circumstantial evidence, but nothing more. People were just as inventive in the 19th century as they are today, but we just don’t know. According to Alcester Local History Society it is thought that “A Warwickshire Man” is the work of Rev CL Langston the vicar of Beoley in the latter part of the 19th century. If so, it would have been a novel way to drum up funds for his church. Or was it all a figment of his imagination – or is the skull that once contained one of the finest brains in history still resting in his church? In a TV programme on Channel 4 on Saturday the 26th of March 2016, they used Ground Penetrating Radar (GPR) to inspect the ground under the gravestone, but to a degree the results were inconclusive. However in the programme they did explain that the “head” end of the grave was covered by a separate piece of stone from the rest of the grave – was this because the original had been broken? The GPR also identified a small void beneath the stone at the head end. Was this because something had been removed? Shakespeare’s grave in Stratford-upon-Avon is inscribed with a chilling curse on anyone who dares to tamper with the Bard’s bones. Our group of grave robbers from the Worcestershire village of Beoley braved the curse. So runs one of the most famous curses of all time. 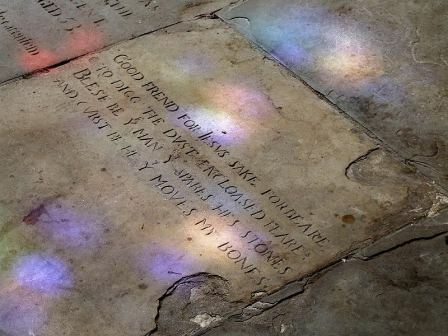 It is to be found on the grave of William Shakespeare, England’s greatest playwright, in the chancel of Holy Trinity Church, Stratford-upon-Avon, and was put there shortly after he died on St George’s Day, 1616 – his 52nd birthday. Its aim was to deter grave robbers and he has lain there undisturbed ever since.